With the onset of spring, even given my limited time out shooting at the moment it is clear that a lot of different species are starting to show up. One of the species that I am now seeing quite regularly loves hiding in amongst the various wattle flowers around at the moment, often backed hard up into the V made between a small branch and a leaf stem. Can you ID this species? 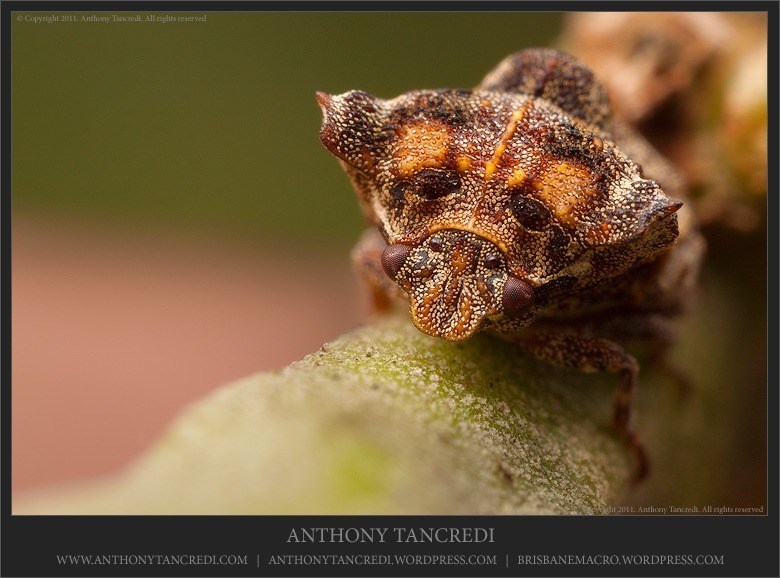 My first thoughts when taking these shots, given the overall body shape and location, was a tree hopper of some sort. Looking at it now though, the head shape looks wrong and thinking back, I have never seen one these “hop”. The species is quite small… between 4 and 5 mm body length are the largest I have seen, and appear fairly common in this particular spot. The entire body is highly textured and the general demeanour is very placid. They will slip around to the other side of the branch when disturbed before slowly moving along the branch to get out of the way. I’d really like an ID on this species, so if you can help, please let me know! 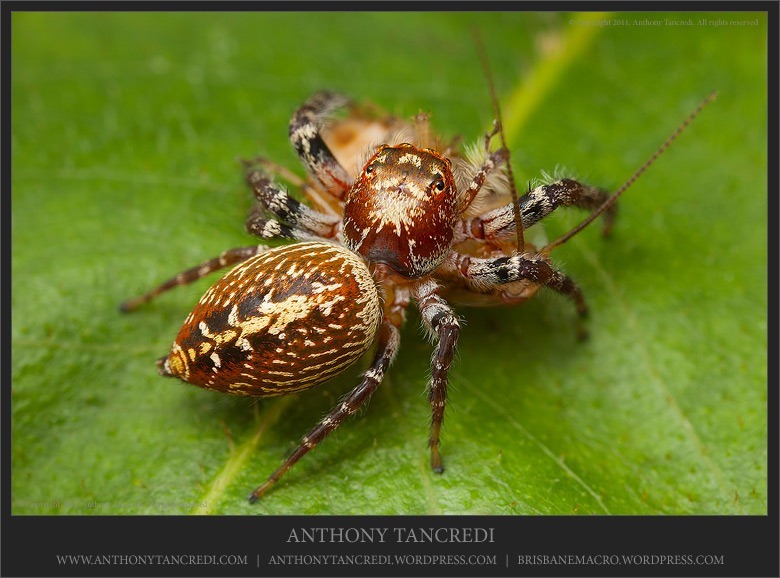 After the pink flower spiders and common lynx, the small garden jumper (Opisthoncus parcedentatus) is the next most common spider I run across when out shooting. In the high stakes world of the beauty pageant, “little miss common” comes in somewhere in the middle of the pack purely on looks, but where she really excels is in the personality department. She is very friendly and is unabashed about posing for a few shots, often looking straight down the barrel of the lens, most likely taking the time to check herself in the reflection. While “little miss common” has those lovely big eyes to help win over the crowd, some say her best angle is actually from back on and she’s not above using her every advantage to ensure she’s remembered. While she may not be as showy as some, “little miss common” really is the full package. She’s easy on the eye with a very pleasant demeanour and is good at providing for the family. If only someone would speak to her about her choice of ingredients in the kitchen…. It’s easy to forget when you see a delicate looking lacewing that they are in fact a carnivorous species. 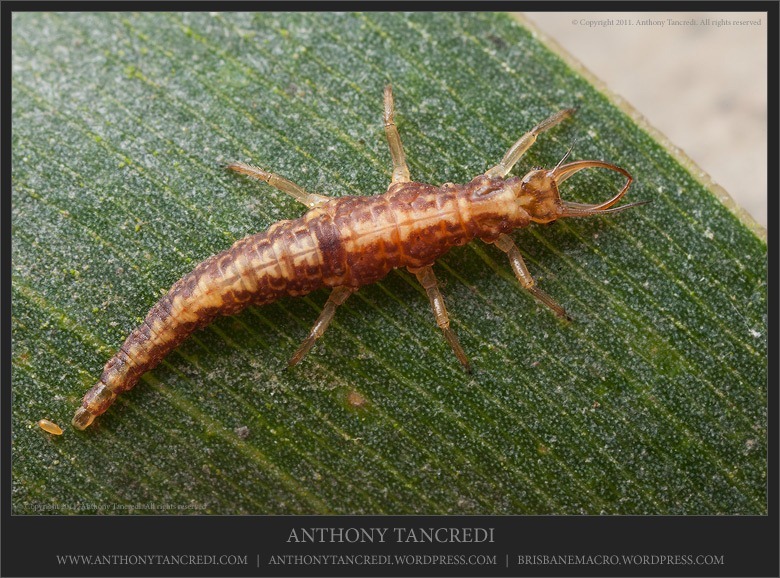 Even at the larval stage lacewings begin feeding on moth larvae and eggs, aphids, thrips and mites. Up until these shots I had never spotted any signs of this particular lacewing species. I knew the area and habitat was right, but I had never managed to run across one of these brown lacewings (Micromus tasmaniae). The thought of finding an adult during this season is quite exciting now that it seems realistic! While not the most picturesque of lacewings, it is always good to see something different. The eggs of the brown lacewing are tiny and each is attached individually to the underside of a leaf. If you look at the rear of the larvae in these images, another egg is visible but I’m unsure as to whether this is another brown lacewing egg or not. A lot of lacewing larvae will actively cover themselves with small pieces of detritus for camouflage, but this particular species prefers to remain unhidden for some reason. On an interesting side note, there has been talk of this particular species being trialled as an aphid control agent. I can only imagine what must run through the minds of an aphid colony when they see the formidable mandibles of these larvae approaching. Time will tell how effective the species is, but if it leads to a few extra lacewings around with no environmental impact, then I wont complain! Last week in a post entitled “Life on the Eucalypt” I showed a couple of shots of a Eucalypt leaf beetle (Chrysophtharta cloelia). 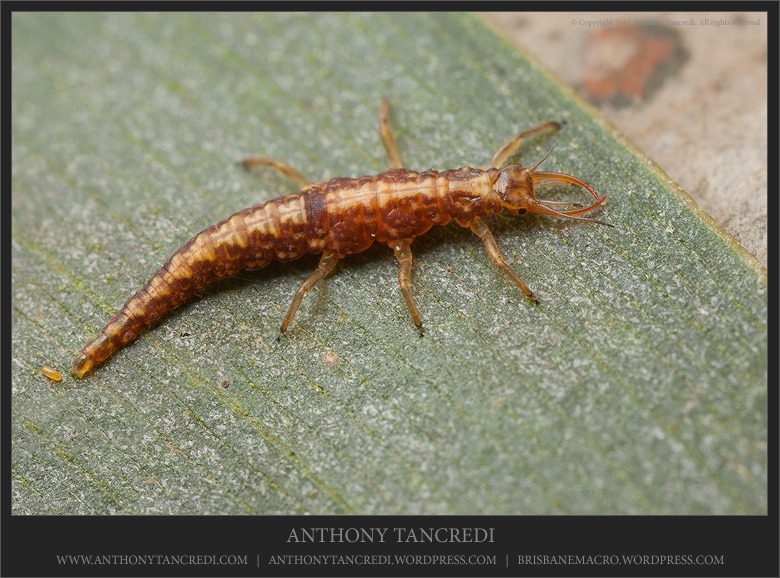 To keep the theme going, I thought today’s post should be of a gathering of 2nd instar larvae of the same beetle. At this young stage, the motto for these tiny larvae (approx. 3mm each) is definitely “safety in numbers”. After hatching out as a group, the larvae huddle together and start eating their leaf from the tip upwards, eventually spreading out to other leaves as they move through their growth cycles. Once the larvae are fully developed, they will travel down the tree before pupating in the soil and emerging as shiny new leaf beetles, ready to take on the world and continue the cycle of life. On a technical note, capturing this image was somewhat awkward as it was necessary to perfectly align the plane of focus with the leaf on which the larvae were sitting. This helped to increase the apparent depth of field in the image, ensuring that as many of the subjects as possible were in sharp focus. Even with this technique, this image required 2 separate shots at slightly different focus points to ensure that all 44 of the larvae were sharp. Due to the fact that most leaves are not perfectly flat, it was an impossibility to capture everything in one image. 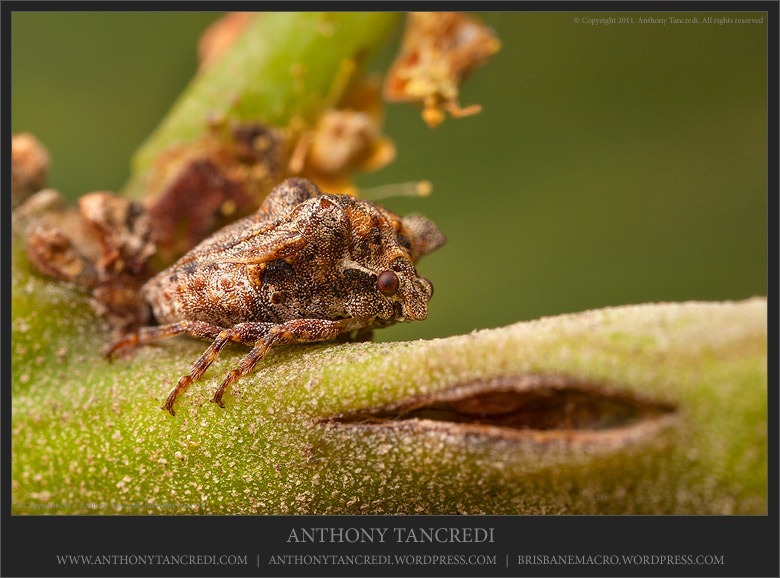 It’s at times like these where techniques such as focus stacking really come into their own and help finish off the image. You are currently viewing the archives for September, 2011 at Brisbane Macro.